Please, not another dreaded “restack” of cubicle space. I understand that space = money, but we already feel like Pringles in a can. It doesn’t matter if the number of coworkers is growing or depleting, the restack remains all too popular. In the case of growth, we must stack tighter! In the case of depletion, we must consolidate space … and stack tighter! 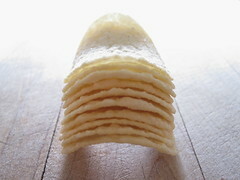 The quest for this perfect stack knows no limits of decency. I once saw a coworker promised a promotion, which allowed him a larger cubicle in the next restack. Construction on said larger cubicle was almost complete, when said promotion was put on hold. Would you believe the coworker observed the restack construction guys DEconstructing the larger cubicle even before he found out his promotion got nixed? What is this "merit increase" thing? Keep your motivational sayings to yourself and not in my email.